Some of the writers here at the Cleveland Movie Blog felt moved to write a little something on the occasion of his passing on April 4th. Newsroom gossip is rarely kind. Remember that fact when The Plain Dealer finally folds; most of the other reporters around will be secretly enjoying the loss with sadistic glee. But the uncomplimentary newsroom tale was told that when Roger Ebert made history as the first film critic to win a Pulitzer Prize, it was really a "fix" by the Pulitzer committee, who were split over whether to give the honor to either Andrew Sarris or Pauline Kael, both much longer established, NYC-based, each with their own polarized cheering sections of readers. Rather than stir up a fuss, gossip goes, the Pulitzer was just handed to the younger, relatively unsung and non-controversial Chicagoan Ebert, the last person anyone expected. That really rather sounds like the opening of PUTNEY SWOPE to me, but so goes the gossip. One cannot doubt, however, that Ebert sure earned that Pulitzer in hindsight. From his groundbreaking television shows, done with and without Gene Siskel, from his many books, from his own film festival, he became a household name in popular-culture cinema criticism with a common-man touch. 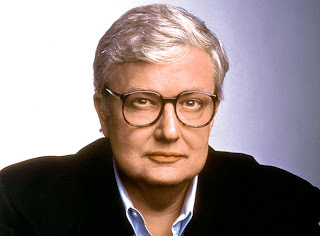 Sure, I sometimes disagreed with his opinions, but I noticed in particular that Roger Ebert possessed a keen knowledge and appreciation of science-fiction, pulp and fantasy literature; when movies in those categories came out, he weighed them with more respect than other beat writers who just tossed them in the B-movie trash heap or kiddie picture ghetto. (The olden-days Plain Dealer and Cleveland Press critics, I do believe, would just walk out of such fare about after 10 minutes. Then probably invoice the paper extra for working over the weekend. No, no tears for the loss). Thus Ebert had the discernment to name DARK CITY the best picture of the year 1998 and hail SWAMP THING and the original HALLOWEEN and the first EMMANUELLE as genre masterworks. And got Mr. Siskel to concur. Yes, even on SWAMP THING. I met Mr. Ebert once. He and Siskel came to Cleveland for a benefit in Playhouse Square, and I was very last of a long line of local reporters to speak with the pair. Ebert especially looked worn out and gray. An ominous portent of the cancer that would plague him? More likely just having a marathon facing so many damned Cleveland media hacks. But in our short session we found out we had some mutual acquaintances in published projects, we both adored using the fairly obsolete Apple Macintosh SE computer on the job; and Roger Ebert really lit up and we enjoyed a real conversation. He was a good guy, and if the aphorism uttered by so many Vietnam vets and penitentiary inmates is true, he's in heaven now. Because he already did his time in hell - watching all those movies. I'm not sure exactly when I first saw Roger Ebert and Gene Siskel on the PBS movie review program Sneak Previews, but I know it was fairly early in the show's run. They were still doing their “dog of the week” segment, my personal favorite part of the show in which they would single out an especially bad film, usually some low budget horror or sci-fi film. Most likely it was 1979 or 1980, so I would have been 9 or 10 at the time. When I started watching the show, my main interest was just in seeing the clips from upcoming films that were part of the show. Soon, however, I became fascinated with the spectacle of these two guys arguing with each other about movies. I took sides early on, feeling that Gene was a little more uptight and self righteous than Roger. Looking back that was probably unfair, but that was how it came across to me at the time. And besides, Roger liked INFRAMAN, a Hong Kong produced variation on the Japanese formula of having robotic superheroes fight rubber suit monsters. It was kind of validating to see this respectable adult, who people apparently considered an expert on movies, giving the “thumbs up” to the kind of trash I enjoyed, and which most critics would have dismissed out of hand. As time went by, I begand to trust Roger's opinion even on movies that were outside of my normal comfort zone. I'm pretty sure Gene liked it, too, but it was Roger's review that got me interested in seeing Japanese director Juzo Itami's 1985 arthouse comedy TAMPOPO. I believe it was my friend Lee, also an Ebert fan, who suggested we rent it when it came out on VHS as a change of pace from our usual movie nights watching gory horror films. This was probably the first time either of us had ever watched a movie with subtitles, and thanks to Roger pointing us in the right direction, the experience was a positive one. To put it simply, watching Roger (and Gene) both broadened and deepened the way I looked at movies, and without them I would probably not have attempted to be a film critic myselff. Based on the many other tributes I've read, I'm far from the only critic for whom this is true. More importantly than those poor fools who thought that, like Roger, they could actually make a career out of being critics are the countless regular people who gained a deeper love and understanding of film from Roger's work. And that's not a bad legacy to leave behind at all. I watched Roger Ebert with Gene Siskel on Sneak Previews and At the Movies on a fairly religious basis. In those pre-Internet days during the Carter and Reagan administrations there simply was no other place a 12-year old kid could see minute-long snippets of hotly anticipated films like MEGAFORCE, RETURN OF THE JEDI, and INDIANA JONES AND THE TEMPLE OF DOOM before their release. Seated alone in the theater together, the two made it cool to be a celluloid geek before anyone else—and way before STAR WARS prequels and superheroes got people discussing characters and debating plotlines months in advance of buying their tickets. Like many, my opinions often differed from Ebert’s on certain titles. It didn’t matter. The important thing was that Roger got viewers thinking and debating about movies. His printed reviews in the Chicago Sun Times and verbal capsule summaries on television created buzz and prompted dialogue—essential goals of effective critique. On Ebert’s passing many are citing him as the greatest film critic ever. I’d venture further and suggest he was the greatest critic ever, period. Certainly the most recognized. Ebert was the first (if most unlikely) “rock star” of movie critics, a pundit who elucidated the merits and enumerated the flaws of work in his chosen arena in a manner that elevated and advanced the medium as a whole. There’s a reason why Roger Ebert is a household name and water cooler god, and it’s because of him that magazine readers and TV audiences are more acquainted with the work of Leonard Maltin and Richard Roeper than David Fricke and Robert Christgau. He could be droll and humorless at times, but Ebert’s nerdy discourse always made for compelling TV. Long regarded by many (including this writer) as the chubby, bespectacled half of the duo who popularized the “two thumbs up” measure of approval, Ebert seemed comfortable enough in his own skin—a couch potato physique not uncommon to his sedentary profession. But the man gave new meaning to courage when coping with cancer in the 2000’s, approaching even the most mundane aspects of life with an Olympic gold medalist’s optimism and stamina—and a child’s immutable sense of wonder. I’ve always admired Ebert’s directness and economy of language in his published work. The guy always picked—or omitted—precisely the right words to impart his thoughts to the everyday reader in a way that never condescended to them nor alienated them from the subject. He always made the right comparisons, drummed up colorful analogies, and offered insightful and entertaining superlatives without seeming verbose or risking hyperbole. Writers know there’s always a fancier adjective to describe whatever it is they’re talking about, but Ebert preferred accessible language and wasn’t afraid to use incomplete sentences or commonplace, one-word zingers if doing so got the point across better. He’ll certainly be missed, but there’ll never be a “roll credits” when it comes to his influence. From “Rosebud” to RAMBO, Roger Ebert’s been my go-to guy. See ya in the lobby, sir.